Welcome to Day 7 of the Winged Blog Tour. I feel like one lucky girl to have this opportunity! 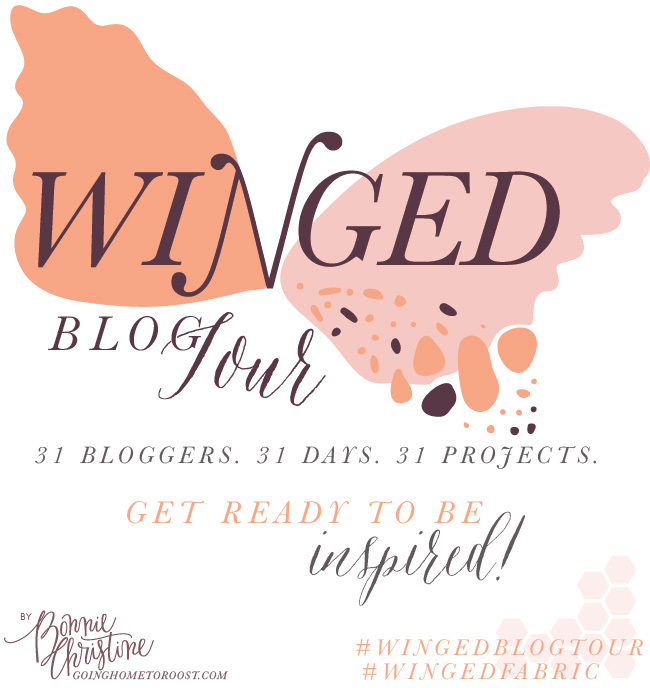 This blog tour celebrates the beautiful Winged fabric collection, designed by Bonnie Christine of Going Home To Roost. There have been some fun and creative things made so far, including the lovely tote yesterday at May Chappell. 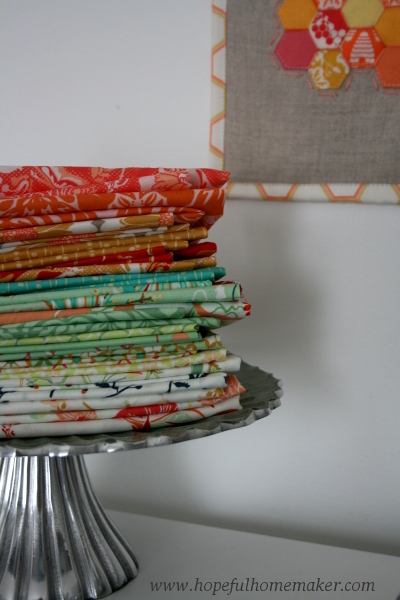 Bonnie’s fabrics have been among my favorites since the release of her first collection, Reminisce. 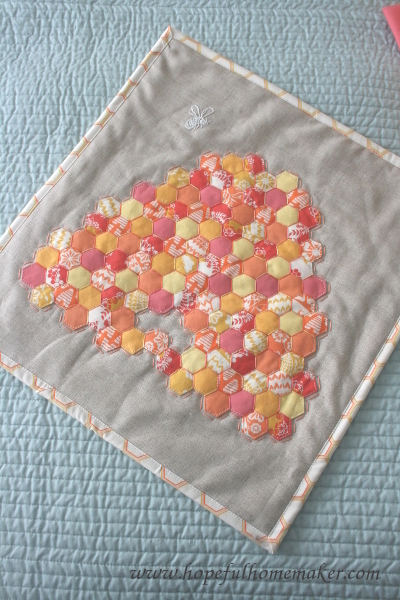 I made my Scrappy Hunter’s Star quilt from that line, and you can find my Sweet as Honey Hexagon Beehive mini quilt here. This new Winged collection is no different. The colors are vibrant and beautiful and the designs have a lot of movement to them, which made sewing with them a delight. Her words resonate with me, as this theme has been much on my mind in recent months. I believe her fabrics capture this idea beautifully and I wanted to sew something that would elevate my thoughts and remind me of my own potential – of the potential within each one of us. As I explored ideas for sewing with these fabrics I was drawn to the traditional circling sparrows block. The problem was, most of them are quite small, designed for English Paper Piecing, or requiring a lot of Y seams. 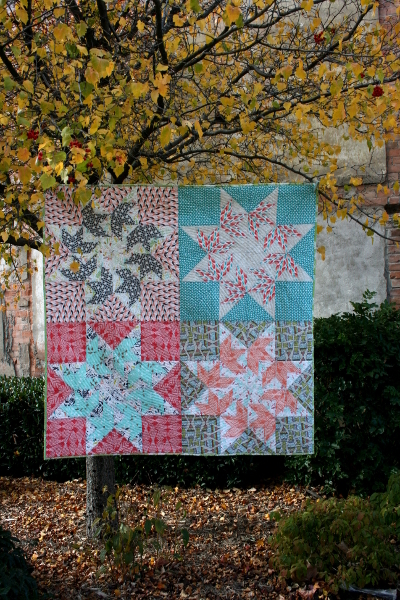 I wanted to showcase the beautiful prints with a larger block and simpler construction, so I drafted a foundation piecing pattern that worked with my vision. 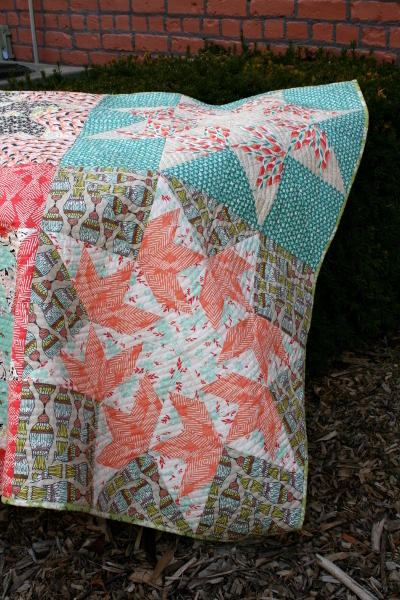 Each of the blocks in this quilt are 26 inches square, so they are big and beautiful and allow each fabric to shine! To unify the blocks I quilted the quilt in a spiral, lines about 1/2 inch apart. This was my first time quilting this style and I enjoyed it immensely. The spiral echoes the circling pattern of the “sparrows” in each block without competing with the fabrics. 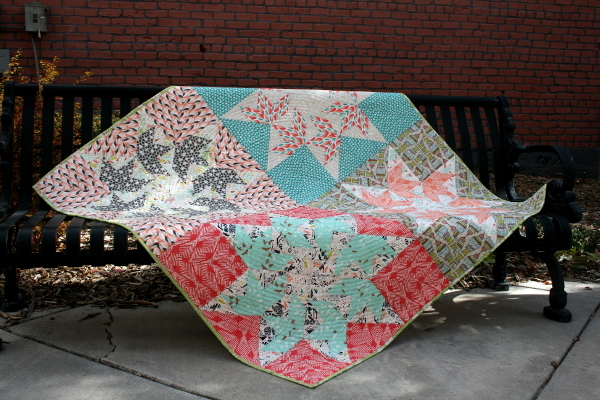 The finished quilt measures approximately 52 inches square. The quilt back is a vintage sheet I purchased a while ago. 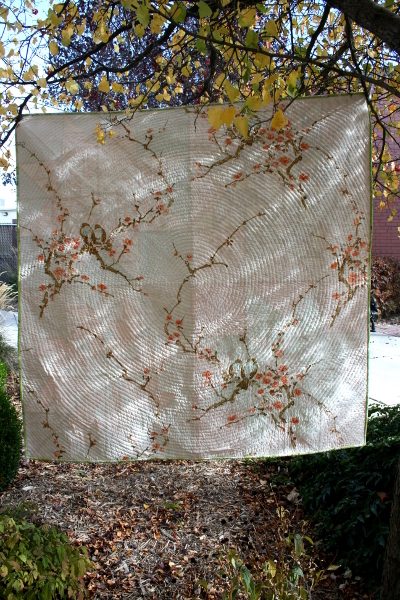 The birds sitting among blossom-covered branches were the perfect compliment to the quilt top, and the colors a great match! 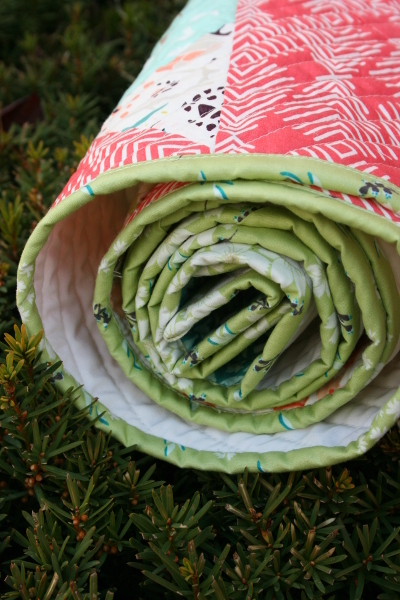 As the weather turns cold and blustery, these fabrics bring cheer to my heart. 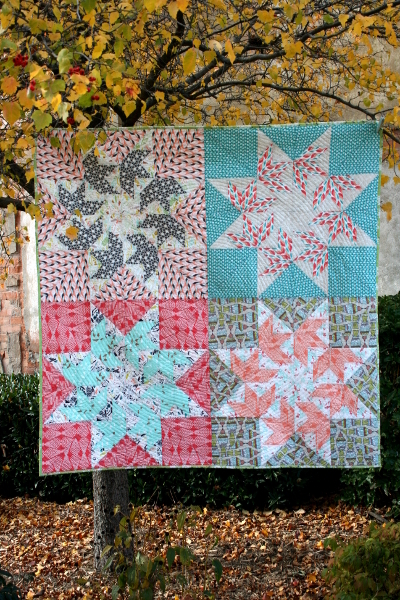 The green flyaway petalums print makes a perfect binding for this quilt. These photos may be my favorites; I love the cute little fingers of my daughter peeking over the edge of the bench. She was so patient while I took photos, but was definitely feeling done by this point! My wish today is that all of us will spread our wings, rejoice in the abilities we have, and soar a little higher. Many thanks to Bonnie for putting together this blog tour! I’ve been hopping along with the schedule and seen some beautiful things. Tomorrow’s stop will be with Jessica at Snickerdoodle Stew and I’m sure she’s got something awesome ready! Phew! It seems like I haven’t finished much this year in the quilting category but I have a finished quilt top! This one makes me happy and I hope you’ll indulge a bit of rambling as I share the reasons why. 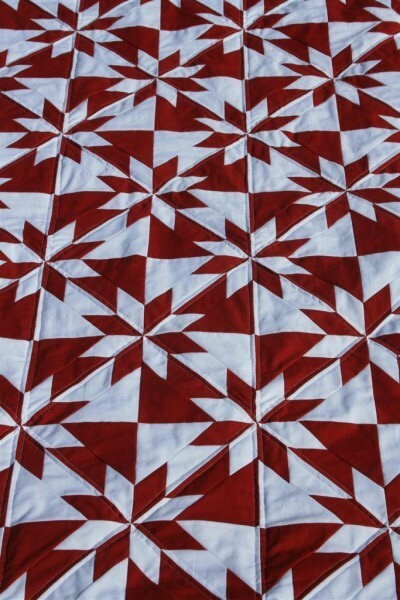 Back in 2011 I finished a traditional Hunter’s Star quilt, red and white, which has been snuggled in, spilled on, stained and loved and then used some more. 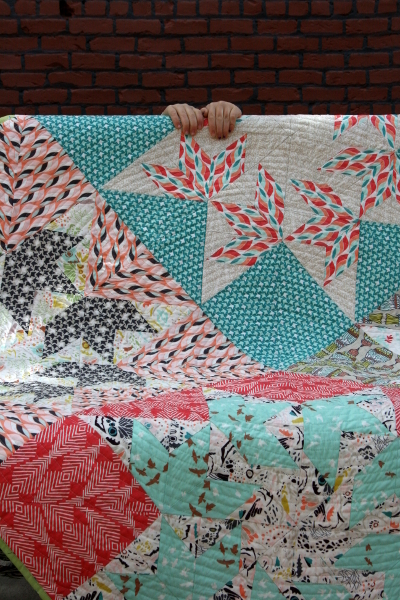 I love this quilt, largely for it’s bold design but also because we’ve loved it so much. Interestingly, I also get new comments on that blog post all the time, and as I was pondering that a few months ago I suddenly saw the design with new eyes. I pictured a scrappy, colorful version, larger than my original quilt and with a small print instead of a solid for the contrasting background. 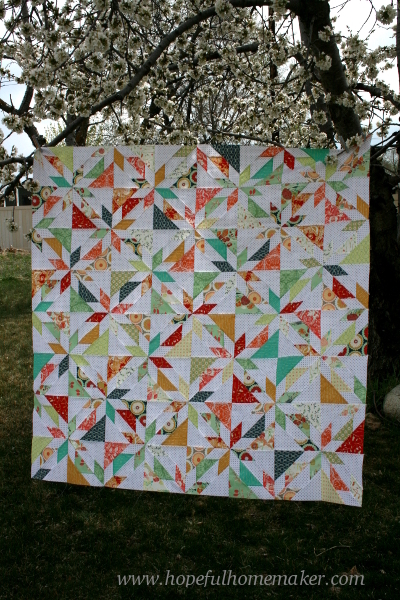 **edited to add: Because this quilt top uses 10 inch sqaures and is perfect for a layer cake, I decided to post a tutorial. You can find it here. 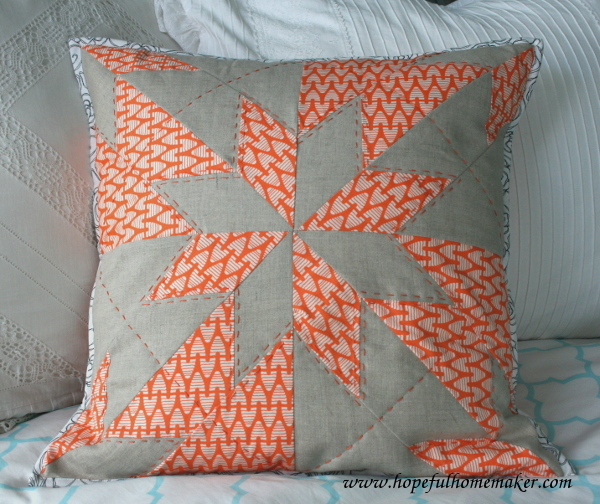 The eight pointed star pattern doesn’t emerge as readily in this version, but still I love it. I love the tiny black polka dots, love the colors and patterns, loved hanging it from my cherry tree that’s suddenly covered in blossoms. 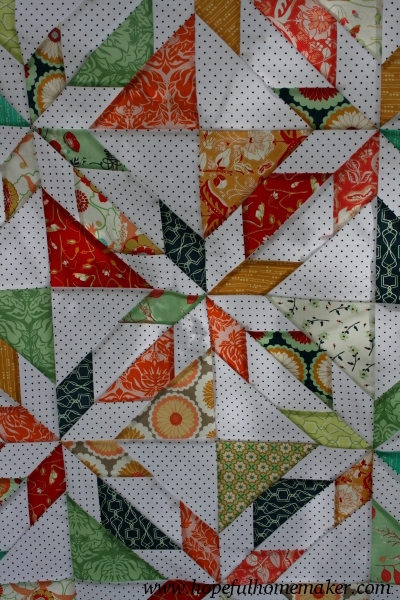 This quilt top also reminds me of a beautiful principle taught by Twyla Tharp in her book, The Creative Habit. I read it a few years ago and one of the parts I loved most was the chapter about scratching for ideas. What stuck with me was her discussion of big and small ideas. She writes about big ideas as things that often come to us when we’re wanting to catch people’s attention, make lots of money, or make a name for ourselves. They are often difficult to execute and can become all-consuming. On the other hand, small ideas may be less significant but are often things that keep generating more ideas. They feed creativity. Sometimes the small ideas end up being best. I guess the biggest reason this quilt top makes me happy is because for me, it’s a celebration of small ideas. I get ideas all the time and some are better than others. Some of them take shape and others seem to fight me. Some of them I don’t have time for while others send me down an unexpected path. This little idea of re-thinking my picture of a hunter’s star quilt block has been a small idea that generated more ideas, more opportunities, and especially more joy in creating. I’m sure someone, somewhere, has already done this with this block, but I’ve never seen it. 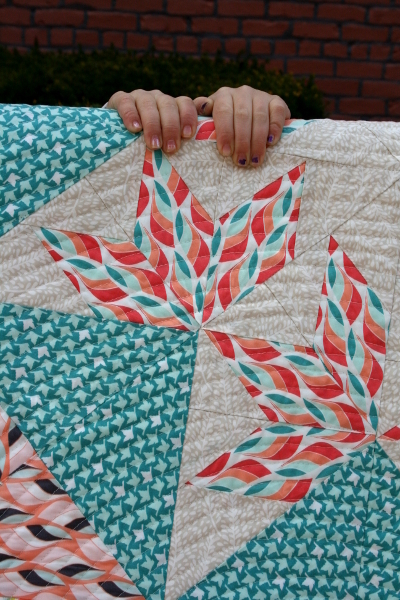 I certainly didn’t create the hunter’s star quilt block, but I’ve loved following the trail of my own vision, bringing to life something I have only seen in my mind’s eye. 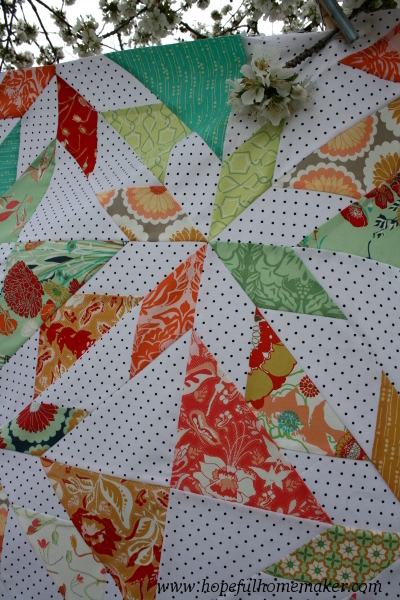 This is something we quilters do all the time, interpreting patterns with our own colors, variations and twists. It’s one of the things I love most about the quilting community – watching how we all inspire each other and are in turn inspired, with more creative outcomes than we can count. Little ideas generate beautiful things, and the more we do it the easier the process becomes. When I look at this quilt top, I see a physical reminder of the journey of creativity that comes through small ideas. That journey brings me joy and is an experience I hope will always be part of my life in some way or another. I hope it’s part of yours, too. 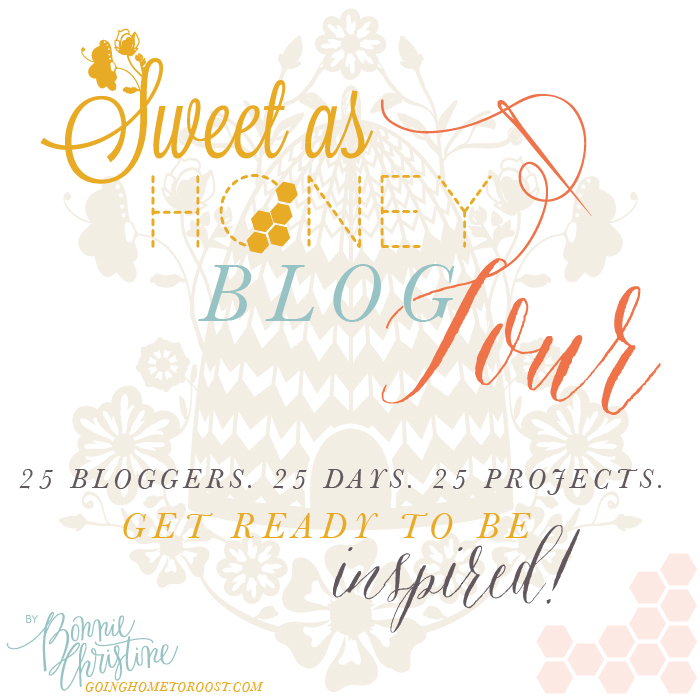 Welcome to Day One of the Sweet as Honey Blog Tour! 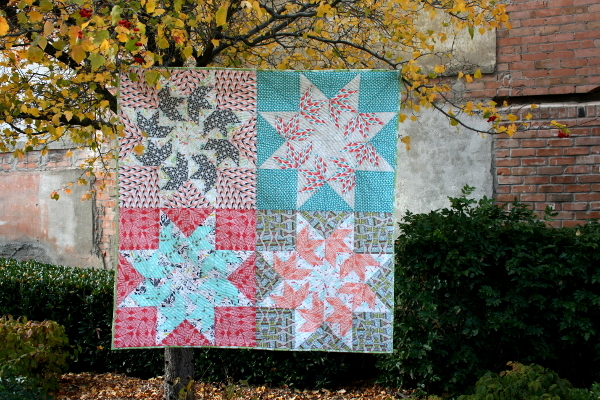 I’m honored to start things off by sharing my projects made with Bonnie’s lovely new fabric collection, Sweet as Honey. 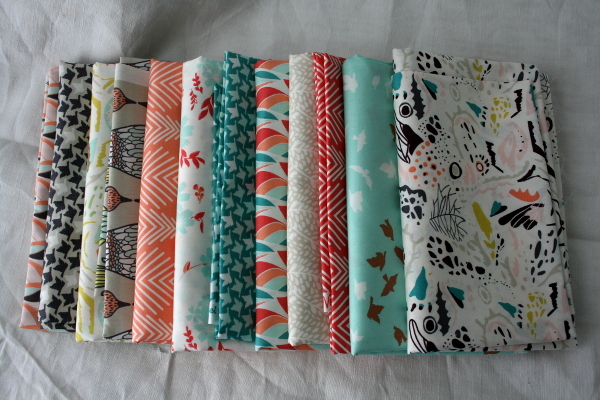 I loved her first fabric collection, Reminisce, and was waiting eagerly for Sweet as Honey to arrive. It does not disappoint! 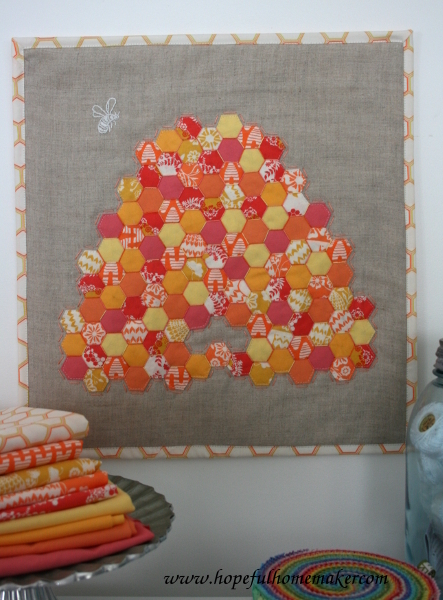 This collection has captured my heart with its beehives, hexagons, and nestled deer. 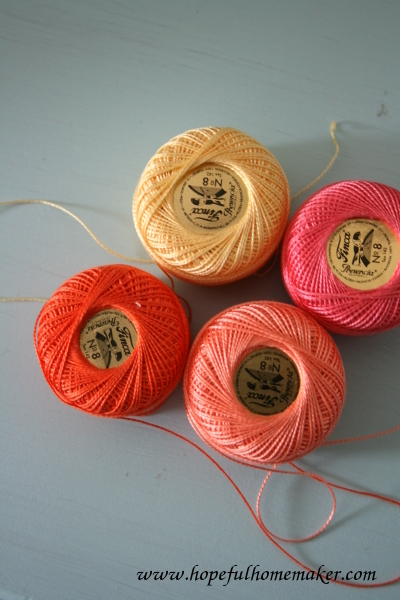 I’ve been drawn to the warm yellow, coral and orange tones in this line. They remind me of a sunrise – my favorite part of the day. When the light hits these fabrics just right, they seem to glow. The warmth and color make me smile. Bonnie generously sent me this beautiful little package to play with, which I immediately paired with a natural linen to create a Hunter’s Star pillow. 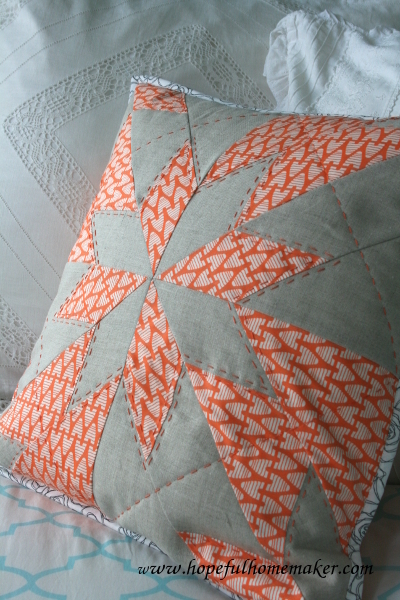 I hand quilted the pillow front with perle cotton to emphasize and frame the eight pointed star. 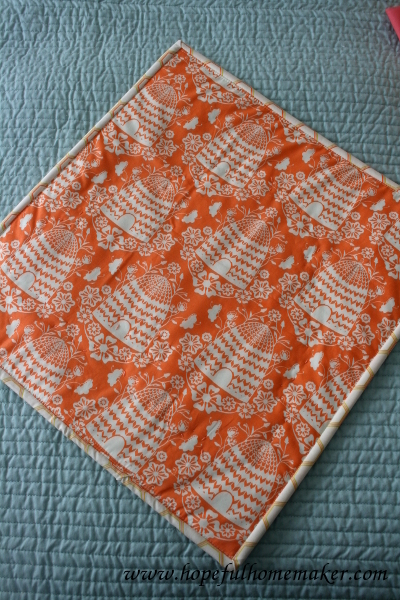 I used a coral solid for the pillow back and chose to bind it with a low volume print for added contrast. 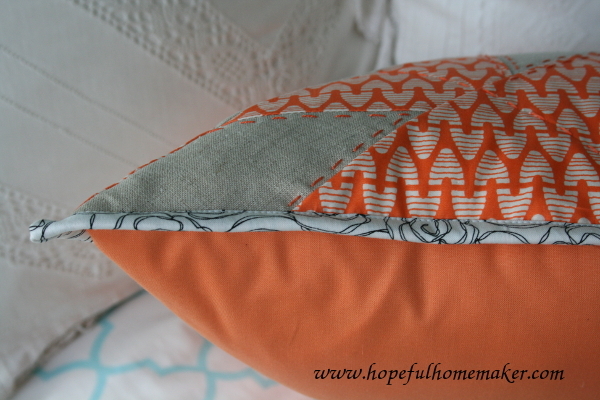 The textures, colors and design harmonize well together and the pillow has quickly become a favorite. It’s a cheerful sight on all the rainy, overcast days we’re having lately. While I was planning this pillow, another idea came to mind and I couldn’t resist trying it. I enjoy growing lavender on our property and every summer I marvel at the wonder of dozens of honey bees surrounding me as I harvest. 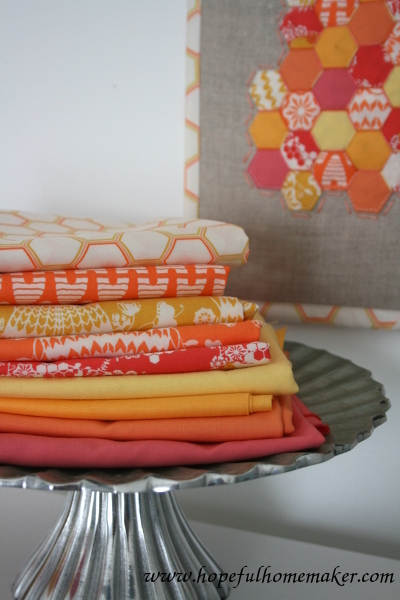 The Sweet as Honey fabrics reminded me of that feeling and fueled the endeavor. In my first effort at English paper piecing, I made 125 half inch hexagons, pieced together in a scrappy style to create a Sweet as Honey beehive! 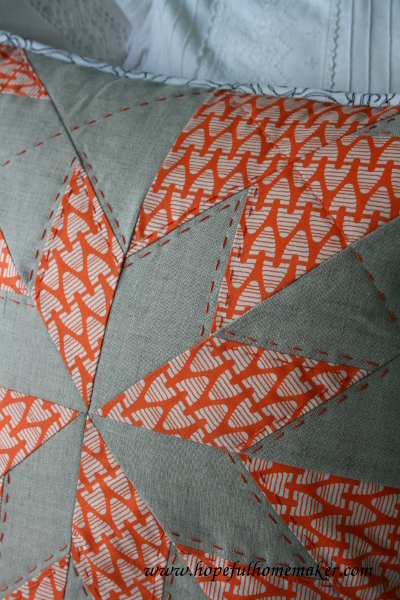 Once again, I preferred linen as a background and added the hexagon print from Bonnie’s line for a binding. 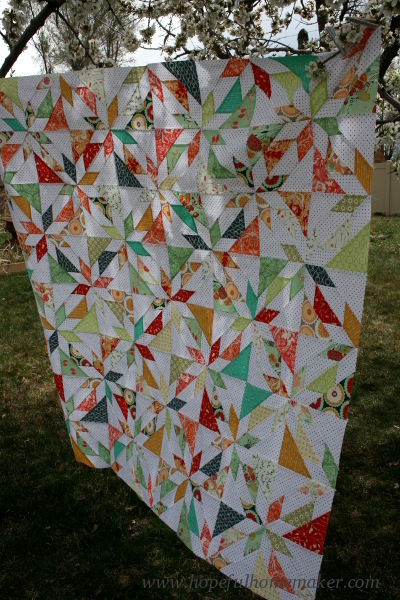 This mini quilt measures 15″ by 16″ and also features a single honey bee, embroidered in white, in the corner. 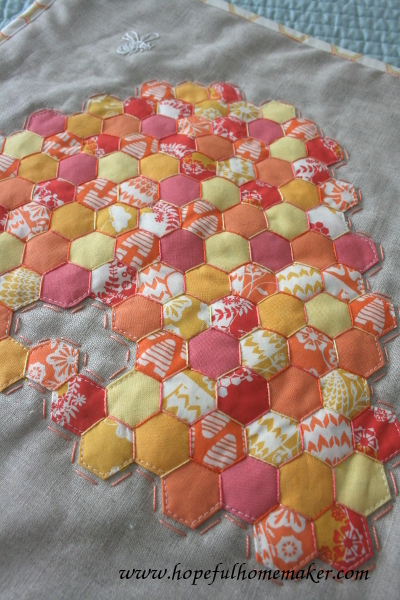 I wanted to add dimension to the beehive, so a variety of coordinating perle cottons were used to hand quilt around each hexagon. This step took time, but was completely worth it. 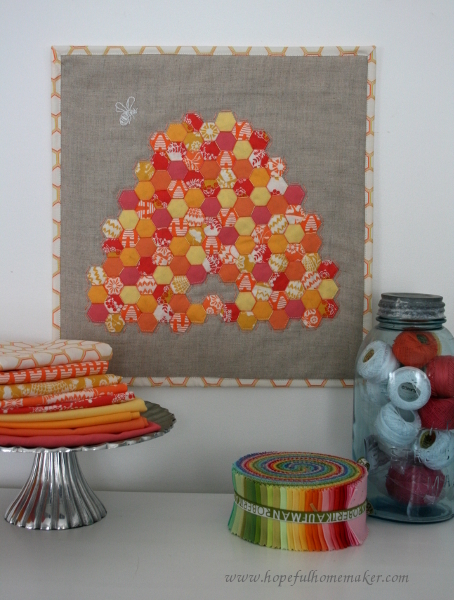 I love the shine of the threads mingling with the colors and prints of the hexagons! I’ve been watching the growing mini quilt craze with interest, and this is my first mini. 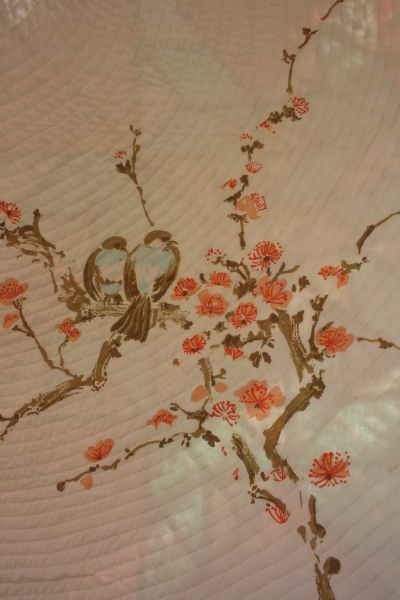 It already hangs in my sewing room, a bright reminder that Spring is on it’s way. 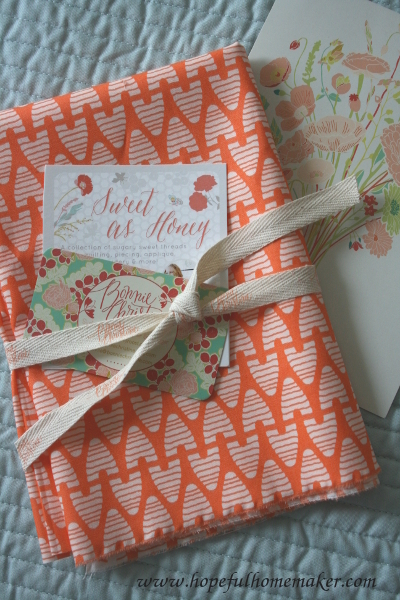 Thanks so much for visiting, and many thanks to Bonnie for creating such lovely fabrics and for allowing me to participate in the Sweet as Honey Blog Tour! Be sure to keep up with the tour, as there are many talented people creating beautiful things with Sweet as Honey. Tomorrow’s feature will be Jessica at Haile & Co. Make sure you visit and see what she’s made!